Cassidy feels honor when she shares her Lakota (Sioux) culture through Fancy Shawl dancing. 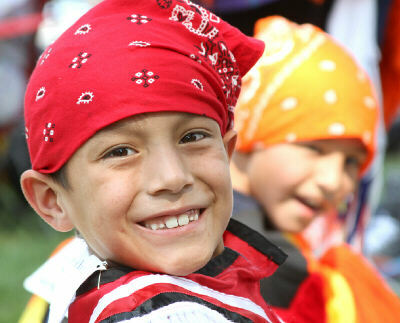 While most of the nation celebrates Columbus Day in early October, South Dakota has celebrated Native American Day since 1990. Thanks to generous friends like you, the Lakota boys and girls learn about their Lakota (Sioux) culture at St. Joseph’s Indian School every day - not just on Native American Day! Students take a Native American Studies class and learn the Lakota language as part of their regular curriculum. We also have events like our annual wacipi - powwow - and other cultural activities, like dance group and drum group. Learn a Four Directions prayer. Experience a powwow by viewing our 2017 Powwow video. Grass dancers at St. Joseph’s annual powwow wait their turn to dance. Wopila tanka - many thanks - for helping our students celebrate and learn more about their American Indian heritage! Share with friends on Facebook and Twitter!